We all need to rant once in a while. It feels good to get things off our chests. 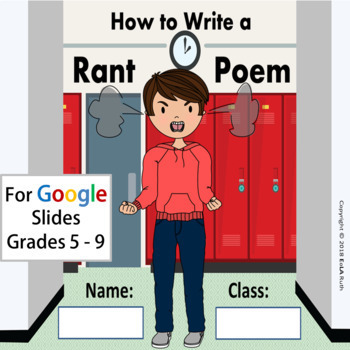 Offer middle school students the chance to rant, and they’ll take off running. 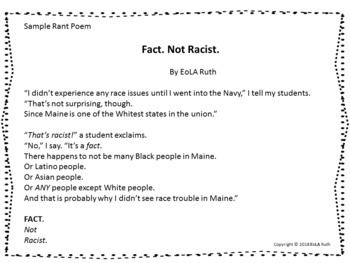 In this Write a Rant Poem lesson for Google Slides, students brainstorm rant ideas and read a sample rant poem about how some students call everything racist. 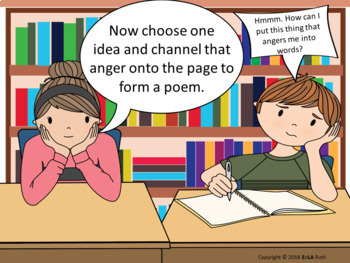 I also advise students not to rhyme their poems as trying to rhyme normally just gets in the way of their ideas. I use this lesson leading up to writing an argument letter or essay. 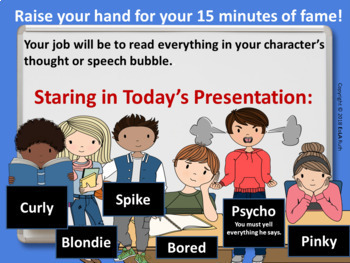 It’s a fun way to get students thinking about how they can use their writing voice to persuade. Product is in both PDF and Google Slides. Sample rant poem included (see third thumb for first page of sample poem).